Astronomers have found the brightest and youngest example yet of a fast-spinning star, suggesting that the extremely luminous versions of these super-dense objects may be far more common than thought. The spinning star, a millisecond pulsar called J1823-3021A, is located inside a packed conglomeration of stars called a globular cluster about 27,000 light-years from Earth in the constellation Sagitarrius. 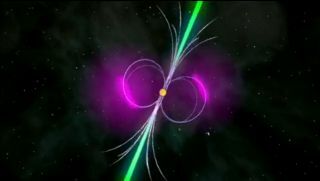 The pulsar emits incredibly intense high-energy gamma rays, which the researchers detected and studied using NASA's Fermi Gamma-Ray Space Telescope. Their analysis suggests the pulsar is just 25 million years old — a baby as far as these stars go, for millisecond pulsars tend to be a billion years old or so, researchers said. "These anomalously energetic millisecond pulsars must be forming at a rate similar to the previously known, more normal millisecond pulsars — at least in globular clusters, but possibly in the whole universe as well," said study lead author Paulo Freire of the Max Planck Institute for Radio Astronomy in Bonn, Germany. "In a sense, this pulsar would be the proverbial tip of a hidden new iceberg." This plot shows the positions of nine new pulsars (magenta) discovered by Fermi and of an unusual millisecond pulsar (green) - the youngest such object known - found by the Fermi Gamma-Ray Space Telescope. With this new batch of discoveries, Fermi has detected more than 100 pulsars in gamma rays. Pulsars form when massive stars die in supernova explosions and their remnants collapse into compact objects made only of the particles called neutrons. When a mass as great as our sun's is packed into a space the size of a city, the conserved angular momentum causes the resulting neutron star to spin very rapidly and to emit a ray of high-energy light that sweeps around like a lighthouse beam. This light appears to pulse because astronomers see the beam only when it's pointed at Earth. "Normal" pulsars rotate at a rate between 7 and 3,750 revolutions per minute, but millisecond pulsars can spin much faster — up to 43,000 rotations per minute. These hyper-spinners are thought to be revved up by accretion of matter from a companion star. Indeed, roughly 80 percent of millisecond pulsars discovered to date are found in binary systems, researchers said. The new study could shed some more light on these exotic objects. The research is detailed online in the Nov. 3 issue of the journal Science. In a separate study, astronomers announced the discovery of nine previously unknown gamma-ray pulsars, also using the Fermi space telescope. Those pulsars had gone unnoticed because they do not shine brightly despite their high energy level, according to scientists with the Max Planck Institute for Gravitational Physics, who announced the find today (Nov. 3). The discovery will be detailed in an upcoming issue of the Astrophysical Journal. "We used a new kind of hierarchical algorithm which we had originally developed for the search for gravitational waves," said study co-author Bruce Allen, director of the Albert Einstein Institute in Hanover, Germany, in a statement. "It's like digging for diamonds or gold: It’s very exciting when you find something." For the J1823-3021A study, researchers trained the Fermi space telescope on the globular cluster NGC 6624. Globular clusters are good places to look for millisecond pulsars, because the dense packing of stars facilitates the formation of binary systems. Freire and his colleagues picked up a lot of gamma-ray emission from the cluster — so much that they initially thought the light was coming from 100 or so millisecond pulsars. But that wasn't the case. "We now find that all detectable gamma-ray emission comes from one single millisecond pulsar," Freire told SPACE.com in an email. That pulsar is J1823-3021A, which is spinning at about 11,100 revolutions per minute, or one complete turn every 5.44 milliseconds. The team didn't discover the pulsar; it has been known since the 1990s. But its incredible gamma-ray brightness remained undetected until now. This image shows the on and off state of gamma rays from pulsar J1823-3021A as seen by Fermi's Large Area Telescope (LAT). The object pulses 183.8 times a second and has a spin period of 5.44 milliseconds, which translates to 11,000 rpm. J1823-3021A also appears to have a much stronger magnetic field than other millisecond pulsars. The exotic object's combination of characteristics is likely to have astronomers scratching their heads, Freire said. "It challenges the way we believe millisecond pulsars form," he said. "It was not thought that, for the spin period of this object (5.44 ms), they could be so energetic and have such a high magnetic field." The researchers aren't yet sure whether millisecond pulsar formation theories will need a tweak or a serious overhaul. "We are currently investigating a number of possibilities," study co-author Michael Kramer, director of the Max Planck Institute for Radio Astronomy, said in a statement. "Nature might even be forming millisecond pulsars in a way we have not anticipated."